Anambas archipelago or Kepulauan Anambas is a small archipelago of Indonesia, it located 200 nautical miles east of Batam Island in the South China Sea between the Malaysian mainland to the west and the island of Borneo to the east. Geographically part of the Tudjuh Archipelago, it is administratively a regency within the Riau Islands Province. Anambas have a large reserve of natural gas that is exported to countries such as Singapore and Malaysia. 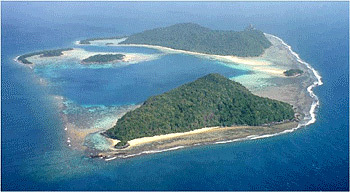 The island of Matak is the main base for oil exploration. Other islands are Siantan (Terempa), Mubur, Jemaja and Kiabu (Airabu). Based on CNN, Anambas Islands is one of Southeast Asia’s most spectacular coastal spots, a must for snorkeling and diving enthusiasts. The main island of Anambas Islands, Pulau Bawah is unhabitat naturally protected lagoon with beautiful clear blue waters and corals. There is also a giant waterfall further inland. Shipwrecked vessels ‘Seven Skies’ and ‘Igara’ have become a magnet for a wide variety of indigenous marine life and offer the perfect opportunity for diving. Sea route: there are two ships serving the route to Anambas Islands, the Pelni Ship which has twice a week departures and pioneer ship which has two departure routes so that departure time is not fixed. If you use the sea route, it usually takes 18-20 hours trip. Air route: You can start a departure from Tanjung Pinang and Batam towards Natuna Airport. From Natuna Airport, you can go to Matak using ground vehicles and then continued with a boat heading to Tarempa in Anambas Islands.